54 maps. - 270 plans. The collection contains mainly source material on the geography of the Eastern Townships in the ninetieth and twentieth centuries such as districts, counties, townships, towns, roads, railroads, lakes and rivers. It also contains source material on Lower Canada, other portions of the Province of Quebec and the Estrie region. It consists of maps and plans. 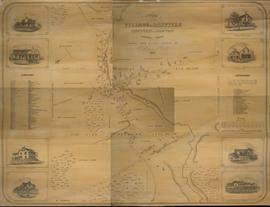 The collection consists of cartographic documents donated individually.